Mother nature was the true winner on Saturday, Dec. 1, as icy road conditions in Storm Lake, IA forced the Buena Vista Beavers to postpone their visit to Dubuque to take on men’s basketball. Driving conditions were deemed hazardous and both schools thought it was in each other’s best interest to postpone the game until a later date. With that being said, I would like to recap a season that has been full of exciting moments, from buzzer beaters to huge upsets. Sophomore forward Cole Navigato rushes through the University of Dubuque defense for a layup. The Spartans gave Loras its first lost of the season. Men’s basketball has definitely lived up to the hype so far, starting off the season 4-1 and looking to build on that record. They opened the season against Greenville University and put on an absolute clinic on the offensive end, erupting for 147 points in an 18-point win. Seniors Josh Ruggles and Ryan Dicanio both went off in that game, combining for 68 points. 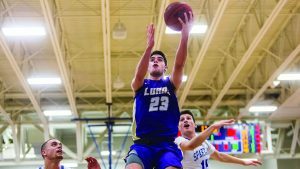 Following a convincing home win, the Duhawks rolled into the Loras Tipoff Classic with a lot of confidence. However, their next opponent, St. Scholastica, gave them all they could handle, keeping the game neck and neck and taking a two-point lead with less than one second to go. However, with the Duhawks in possession of the ball, Dicanio found sophomore Rowan McGowen way outside the arc. McGowen put up a prayer at the buzzer, and after bouncing around on the rim for a while, finally went through the net and the Duhawks ended up a winner 81-80. To close out the Loras Tipoff Classic, Loras went up against Olivet College, who had a lot of size. However, the Comets were plagued by foul trouble in the second half, sending their starters to the bench for a while. The Duhawks were able to capitalize, scoring 59 second-half points and coming away with the 105-88 victory. With the Duhawks flying high, they were looking to carry the momentum into a matchup against third ranked Augustana. 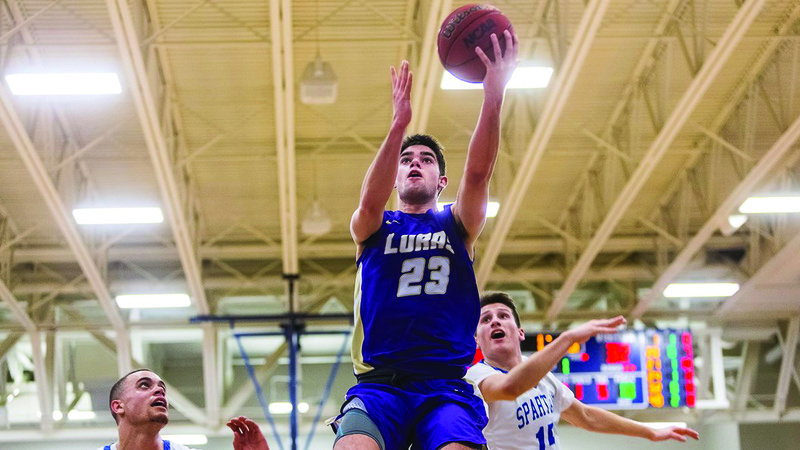 With one tenth of a second remaining in the game, Dicanio nailed two free throws to send Augustana packing and Loras completed the stunning upset. This mark put Loras at 4-0 on the season and earned them the honor of being the 19th ranked team in the nation, the first time the team has cracked the AP Top 25 in school history. The Duhawks hit the court once against this Saturday, Dec. 8, to take on the Foresters of Lake Forest College. Tip time is set for 4 p.m. in the AWC.